on music and a smile. too averse to turn them away. at one time or other, with you. in bursts of colour and chorus. a beautiful time to die. Sophia is an experienced Compassionate Communication and Empathy teacher for nearly 12 years. She has facilitated many workshops over the years on Grief and Mourning, Guilt and Shame, Anger and Depression, to help mitigate the changing landscape of life’s trials, tribulations and unexpressed grief. This personal and/or family loss may be due to the death of a beloved family member or friend, a cherished pet, separation, divorce, children leaving home, bullying, loss or change of residence, redundancy, business liquidation or bankruptcy. Sophia is an experienced Compassionate Nonviolent Communication (NVC) trainer and Compassion & Empathy teacher for nearly 12 years. She has facilitated Death Cafes and workshops over the years on Grief and Mourning, Guilt and Shame, Anger and Depression, to help mitigate the changing landscape of life’s trials, tribulations and unexpressed grief. This personal and/or family loss may be due to the death of a beloved family member, friend or colleague, or a cherished pet. An Introduction to Understanding Death in our evolutionary Soul journey. Our Ideas about death have been erroneous; we have looked upon it as the great and ultimate terror, whereas in reality it is the great escape, the entrance into a fuller measure of activity, and the release of the life from the crystallized vehicle and inadequate form. Death, if we could realise it, is one of our most practised activities. We have died many times and shall die again and again. Death is essentially a matter of consciousness. We are conscious one moment on the physical plane, and a moment later we have withdrawn onto another plane and are actively conscious there. 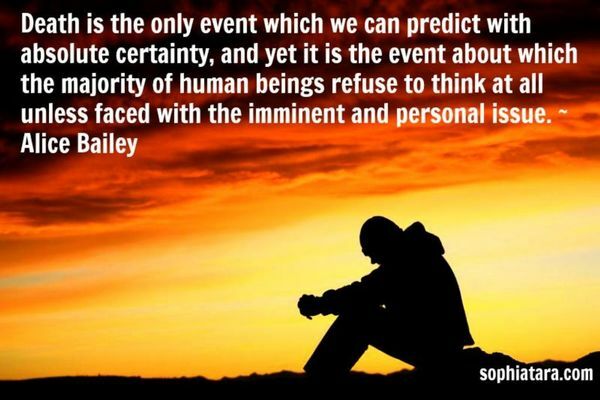 Just as soon as we know ourselves to be Souls, and find that we are capable of focussing our consciousness or sense of awareness in any form or on any plane at will….we shall no longer know death. * A terror of the final rending processes in the act of death itself. * Horror of the unknown and the indefinable. * Doubt as to final immortality. * Unhappiness at leaving loved ones behind or of being left behind. * Ancient reactions to past violent deaths, lying deep in the subconsciousness. * Clinging to form life, because primarily identified with it in consciousness. * Old erroneous teaching as to Heaven and Hell, both equally unpleasant in prospect to certain types. Your Presenter Sophia is a life-long student and teacher of The Ageless Wisdom tradition, Esoteric Literature and Soul Psychology. She is also a long time Futurist, Cosmologist, Esotericist, UFOlogist, Planetary Meditator, Soul Educator and public speaker for various causes. 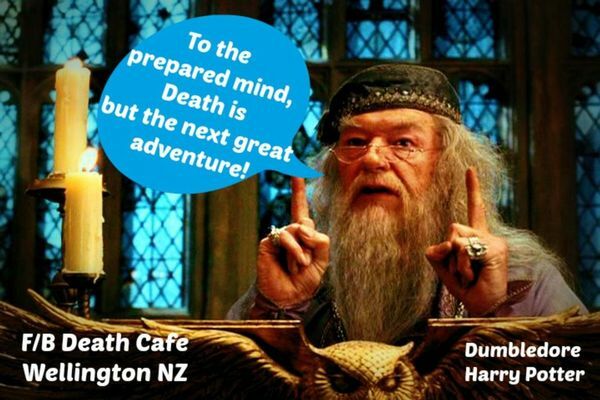 Death Cafes in Wellington: Sophia founded the 1st Public Death Cafe in the Wellington Region and New Zealand. It brings together communities to exchange conversations about life and death, to ponder, wonder and celebrate the Art of Living and Dying in compassionate community. Sophia is an advocate for the expression of Soul Creativity, progressive education and healing, she is passionate about Future Schools and Societies, sustainable Eco-Communities, Raw Food and Natural Healing, Soul Psychology, the World Teacher for All Humanity, Transmission Meditation, UFOs & Their Spiritual Mission, Empathy Matters, Emotional Literacy and Intelligence in classrooms and the NZ school curriculum. She also teaches Ukuleles for Peace and runs a weekly Ukulele Meetup Group in Wellington. Sophia is a NZ trained teacher and studied at Victoria University. She is in the process of writing books for adults and children. Cost: $20 towards venue costs and photocopy handouts.